Jazz 1 going to NYC for Essentially Ellington 2019! Click "donate" below to help support the cause! Congratulations to the 15 finalist bands that will compete in the 24th Annual Essentially Ellington High School Jazz Band Competition and Festival May 9-11th. Support Sun Prairie Band simply by shopping on Amazon. Click on the image above and enter Sun Prairie High School Band Boosters, Inc. as your charity of choice. .5% of all purchases are donated to SPBB!! 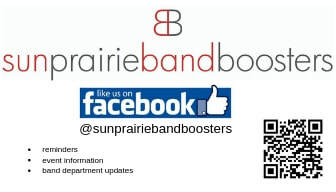 Welcome to the Sun Prairie Band Boosters Website! Sun Prairie Bands are proud to include over 750 students in grades 6 - 12 at four different buildings. This website will help you find more information about all the bands and related opportunities in Sun Prairie. The High School is home to students in 10th - 12th grade. Cardinal Heights is home to students in 8th & 9th grade. Patrick Marsh is one of two 6th & 7th grade buildings. Prairie View is one of two 6th & 7th grade buildings. The Band Boosters are an integral component of the band program that support all bands in Sun Prairie. This foundation is a non-profit organization dedicated to ensuring the long-term success of band music education at Sun Prairie. Music has been prominent in the community since 1876 when the Sun Prairie Brass Band Association was first formed by Dr. Charles Crosse. The SPBBA supported the Sun Prairie Cornet Band which played at many community events and holiday functions throughout its’ existence. In 1907 music first became a part of the Sun Prairie public school curriculum and the first public school band was created in 1925. Today there are over 750 students enrolled in Sun Prairie public school bands.